Back in 2002, certain symbols were selected to represent the College – a lighthouse, motto, water and the Southern Cross. These illustrations were incorporated from those available and the colours of red, blue, white and gold were used in the design. Over the years, our College has grown from one of hope that we would flourish as a new school, to one of a strong, faith-based community. As a Catholic School the College has developed a culture that now reflects how Mary MacKillop has been canonized as Australia’s first Saint in 2010 and for its association with Mary MacKillop’s religious congregation, the Sisters of St. Joseph. In 2015, a new logo was launched to reflect the new spirit and mission of the College by using our original symbols in a contemporary way. 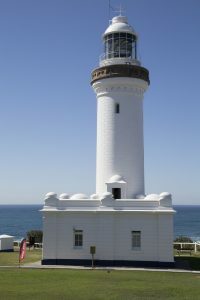 The lighthouse represents our College motto of ‘Christ Our Light’, and with Norah Head Lighthouse so close to home, it emphasises this connection.